"Easy and delicious. Add more pepper flakes if you like it spicy." Place butter into a 9x13-inch baking dish and set in oven while it preheats until butter is melted, about 5 minutes. Stir onion, basil, red pepper flakes, salt, and black pepper into melted butter. Add chicken, turning to coat with onion mixture and ending skin-side up. Bake in the preheated oven until no longer pink at the bone and the juices run clear, about 1 hour. An instant-read thermometer inserted near the bone should read 165 degrees F (74 degrees C). Remove chicken from dish. 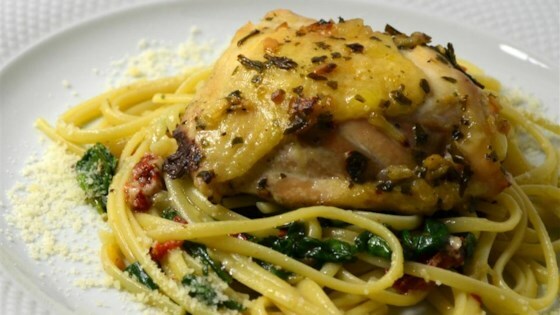 Mix spinach into onion-butter sauce until thoroughly mixed; add linguine and Parmesan cheese, tossing to combine. Place chicken on top of pasta. Baked chicken with homemade BBQ sauce. This was so good. I used chicken brests-browned first in a skillet, then followed the recipe. So delicious. I did not care for this recipe. Not flavorful, even after adding garlic and mushrooms, and too greasy.